GEOFFREY C. WARD, historian and screenwriter, is the author of nineteen books, including A First-Class Temperament: The Emergence of Franklin Roosevelt, which won the National Book Critics Circle Award, the Francis Parkman Prize, and was a finalist for the Pulitzer Prize. He has written or cowritten many documentary films, including The War, The Civil War, Baseball, The West, Mark Twain, Not for Ourselves Alone, and Jazz. KEN BURNS, the producer and director of numerous film series, including Vietnam, The Roosevelts, and The War, founded his own documentary film company, Florentine Films, in 1976. His landmark film The Civil War was the highest-rated series in the history of American public television, and his work has won numerous prizes, including the Emmy and Peabody Awards, and two Academy Award nominations. He lives in Walpole, New Hampshire. LYNN NOVICK's previous directing credits include Prohibition, a three part series on the rise, rule, and fall of the 18th Amendment; Frank Lloyd Wright, a two part biography of the architect; and The Tenth Inning, a four hour sequel to Burns's Baseball, which Novick produced. She also produced his 20 hour series, Jazz. She has received Peabody and Emmy awards. "The companion volume to Burns’ Vietnam War documentary series on PBS, the book stands alone as a powerful summary of the whole conflict. It tells the story of the war from every conceivable angle, including that of the young Vietnamese fighters. It’s extraordinarily well-reported and written, and filled with memorable photographs and illustrations—a reminder that the war was, perhaps for the first time, shaped as much by powerful images as written reports." —Lancaster Online, Mark Bowden's "Ten Favorite Books on the Vietnam War"
"A vivid and often captivating volume…a valuable resource." "Once again Geoffrey C. Ward and Ken Burns deliver the grand historical goods in this feast of a book. For those too young to remember the Vietnam War, this is the essential primer. For those old enough to have Vietnam flashbacks or battle scars, read it and weep. Highly recommended!!" 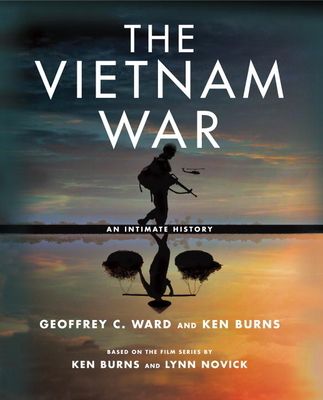 "A sweeping, richly illustrated narrative of a conflict fast retreating in memory... As they have done in numerous collaborations, Ward and Burns take a vast topic and personalize it... Of particular value is the inclusion of Vietnamese voices on both sides of the conflict, most of whom agree more than four decades later that the question of who won or lost is less important than the fact that no one really prevailed... The text is accompanied by more than 500 photographs, some of them immediately recognizable...many others fresh... Accompanying the PBS series to be aired in September 2017, this is an outstanding, indispensable survey of the Vietnam War." "Lucid, flowing, and dramatic… Robustly detailed writing… Eye-opening… Powerful in its own right… In their new ‘intimate’ yet capacious history, the award-winning, audience-enthralling duo of historian and screenwriter Ward and documentarian extraordinaire Burns investigate the complex, divisive, and tragic Vietnam War from a unique plurality of perspectives… This is a vivid, affecting, definitive, and essential illustrated history." "Lavishly illustrated…. Well-written and deeply researched, this history covers virtually every aspect of the French and American wars in Vietnam from 1945-1975, focusing mainly on military, diplomatic, and political issues…. Anyone looking for an expansive overview of the Vietnam War will find much to admire here."